This week has been a crazy busy week. My sweet husband Chris and I are launching a new website for deaf dogs and their owners hopefully by next week. What that means is we have had a very hectic week. So far in the last five days I have done somewhere around 40 posts and I am doing the new site in Wordpress. I'm really not one to readily embrace change but now I am learning Wordpress. I like blogger but it has many glitches for example, I can never reply to folks who leave comments. When I try to leave a comment to reply, blogger makes me log in over and over and over again. I usually give up because I get so frustrating so with that being said, I want to thank all of you for coming to visit us here at Lexi's World. Lexi and I appreciate you taking the time to share your thoughts and smiles with us. I did get a chance to go to a few of my favorite blogs on Saturday morning (around 12:30am) and I really enjoyed my friend Kristin G's amazing photo gallery she put up for the Saturday Pet Blogger Hop. You see Kristin has the most elegant dogs I have ever seen and she decided to do a photo layout of two of her dogs in black and white. Kristin is the head writer and photographer over at Dogs Rock blog. She has totally inspired me by posting some of the most beautiful black and white photos of her dogs Zoe and Xander. For Special Effects Sunday this week I decided to dedicate this post to Kristin G. and Dogs Rock because I think they ROCK! I shot these for the launch of our new deaf dog website. I will let you know what the new web address is as soon as we get things a little more organized. In the photos above I added a little twist because I love Nitro's blue eye. I went 90% black and white and 10% with a little color so I could draw attention to Nitro's colored patch over his blue eye. Happy Special Effects Sunday! Thanks for following The World According To Lexi. According to my dog Lexi, you are the best! 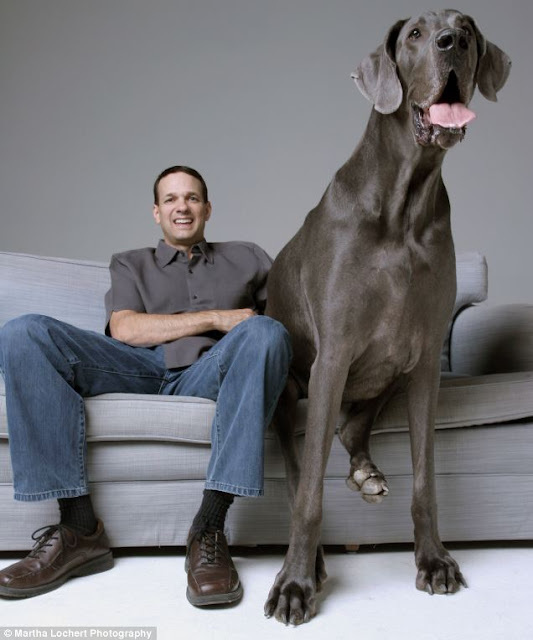 According to my dog Lexi, she thinks the dog is very brave! Here on Bluebird Farm the dogs don't get to mix with the horses because we worry about them getting kicked or even killed. My mare Reiny is not a big fan of dogs. I do take Nitro out to the barn to see my big horse Skippy and he is very affectionate with him so maybe one day I will get a video of them smooching but in the mean time, check out this video of the dog playing tag with the horse. Happy Pet Blog Hopping! Since we have Nitro here on Bluebird Farm, things have changed so much mainly because Nitro is a Boxer. Boxers are just different in every way. If they get their mind set on one object or a task they will stay focused on that item or task until they get it done. Since we have lots of dogs and horses here on Bluebird Farm, I thought this video was a good representation of what goes on when you mix horses with dogs or in this case a show horse with a boxer. Silly boxer boy! Enjoy! Welcome To Our Marvelous Monday Photo of The Week! Look at these two boxer babies! 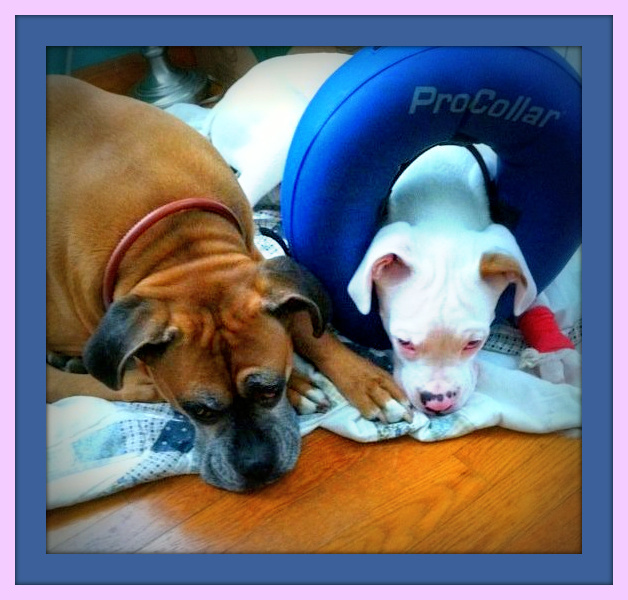 This is Chloe (from L to R) and the white boxer wearing the blue "collar of shame" is Brickel. Look how much they adore each other. Thanks to our new boxer friend Vicky Sitterly for letting us share her two babies with all of our blog followers. According to my dog Lexi, she thinks they are both adorable! Happy Marvelous Monday! According to my dog Lexi, it is Special Effects Sunday here on the World According To Lexi. What that means is I get to play and have fun with my photos by applying layers of special effects and hopefully you will all enjoy the different graphic combinations. Happy Summer Sunday! I have chosen this photo of Nitro chilling out in the back yard to start our Special Effects Sunday.Look at this "landshark's" jaws! It is a good thing he is a sweet gentle and loving boy! Here I did a little brightness and added a Poster effect. This photo represents how Nitro felt this past week with temps in the 95 to 100 degree range. This special effect would be a great on a photo card around Easter time because of the soft pastel colors. We hope you enjoyed our little excursion into Special Effects Sunday. 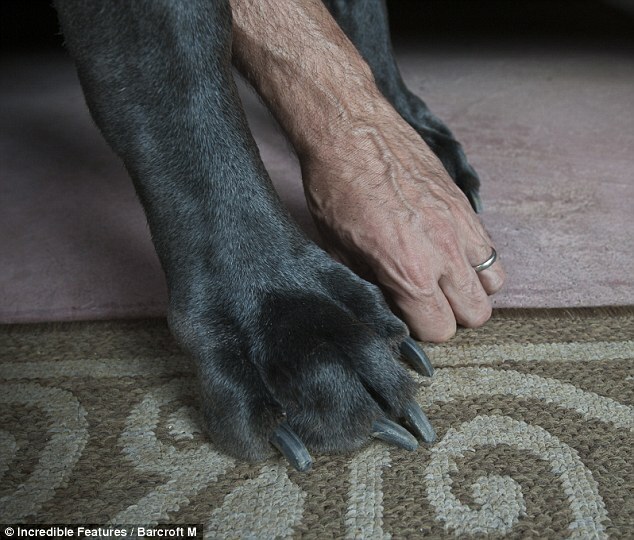 I found this on MailOnline in the News and I thought it was a great article...enjoy my dog loving friends! The first time we saw George, our beloved Great Dane, he was no more than a tiny, cowering ball of fuzzy fur. Saturday Pet Blogger Hop - Summer Time is Fair Time! The first week of July is the Salem Fair here in Salem Virginia. We go every year, walk around, snack on great fair food and check out all the exhibits. Chris and I had a great time and we even got to eat some Kettle Corn (which is our favorite popcorn to eat). Below are some photo from our Salem Fair outing. Enjoy! This is a baby Dromedary Camel. They are white and will turn brown as they are growing up. The baby Dromedary Camel was giving his human mommy smooches while she was trying to bottle feed him. Here are tow baby African Equids otherwise known as Zebras. It was a long hot day and now they are resting in the cool breeze of the summer evening. I don't know what all the animals are called but here are some photos of some cute exotic animals. This is a little Miniture pinto colt. He will probably finish his height out at around 32"-38"
Here are a couple of Llamas resting after a long hot day. Check out the "lion" hair cut on the red Llama! Suuuueeeee! Suuuuueee! That's how we call pigs in Iowa! Below are photos of the Salem Fair grounds at night. I love the bright lights against the dark July sky! I shot these with my new Nikon Coolpix P500. It is suppose to do really well in low light with no flash and I think the camera did a great job of photographing all the beautiful neon lights. What do you think? Every kid's dream...A slushy machine with every flavor! The Salem Fair had a couple of different sized Ferris Wheels so if someone is scard of going up really high they could ride in the smaller Ferris Wheel. A Fair would not be a true Fair without Funnel Cake. They also had these cool little arcade games available for those who want to take a chance with their money to win more money. This is the smaller Ferris Wheel. I love the royal blue lights on this one. I love this old classic ride....The Zipper! Remember those when we were kids?